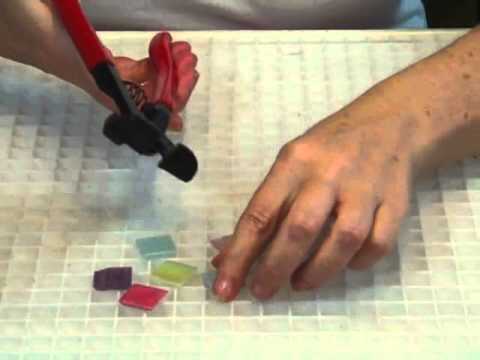 Wheeled glass cutters are essential for creating glass mosaics. I use it to cut and shape vitreous glass and stained glass. It can also be used to cut smalti. The wheeled cutters make cleaner cuts than tile nippers. The two carbide wheels (or steel, if you buy cheap cutters) are fixed in position. 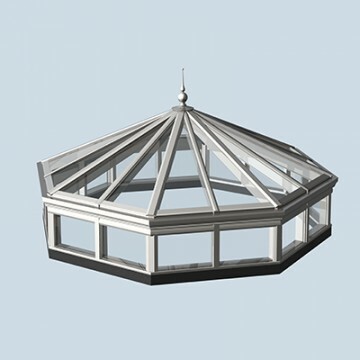 Instead of scoring and breaking, the wheels apply even pressure to the top and bottom sides of the glass, causing it to fracture along the line of the wheels. The wheels are replaceable and eventually go dull, but not before several thousand cuts. Each wheel is held in place by a setscrew (usually an Allen screw). As your cuts become noticeably less clean than when the cutters were new, use an Allen wrench to loosen the screws, rotate each wheel about 1/8-inch, and then re-tighten the screws. By changing the location of where each wheel touches the glass, you have, in effect, replaced the blades. It'll take a long time and many cuts to use the entire circumference of the wheels, especially if they're carbide. When the wheels finally do become dull, I suggest buying a whole new tool. The wheels make up the bulk of the tool's cost, so you won't save much by just buying replacement wheels. With a brand new tool, not only are the wheels sharp, but the rubber handle grips are new and clean (the rubber wears down and becomes dirty) and the spring is secured in-place. Every now and then, the spring breaks free from my cutters. The tool still works with a loose spring, but there's nothing to keep the handles from spreading too far apart. When that happens, the spring falls off. It's quite annoying to drop the spring, watch it bounce out of reach, and then have to get out of my chair to retrieve it. I tried soldering it permanently in place, but it didn't work because I couldn't get the metal hot enough. So, until I buy a new tool, the spring constantly falls off. Another reason to buy a new tool instead of just replacement wheels is, if you drop the tool, it's possible to knock the wheels out of alignment. So, after several projects when you think the wheels need replacing, I suggest buying a whole new tool. When your new tool arrives, use an Allen wrench to tighten the screws as tight as possible. Then, use an engraver, paint, felt-tip marker (or whatever you have that makes a permanent mark) to make a small tick mark on the side of each wheel where it touches the glass when cutting (the two tick marks should be aligned opposite each other). I use an engraving tool for making the tick marks so I don't have to worry about paint or ink eventually rubbing off. After a few hundred cuts, loosen the screws, turn each wheel slightly, and then re tighten the screws. After several of these adjustments, the tick marks have gone full circle indicating that it's time to replace the tool (or just the wheels, if you prefer). Don't be surprised if the wheels rotate by themselves. No matter how hard I crank down on those screws, it apparently isn't tight enough because the wheels slowly rotate by themselves from the pressure exerted during the cutting action. After several days and many cuts, I notice the tick marks are no longer aligned directly opposite each other, which indicates the wheels have rotated slightly. Maybe I'm a weakling, but I just can't get the screws tight enough to keep them static. However, that's okay with me because, if they turn by themselves, then I don't have to manually do it.